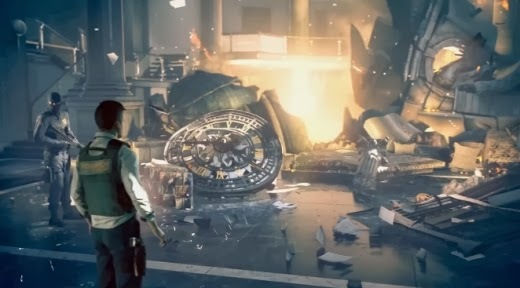 As part of the VGX broadcast on 7th December 2013, Remedy released a gameplay trailer showcasing never before seen footage from the title. In the video Sam announced a series of features as well as expanding on the gameplay mechanics and the storyline. In this article we’re going to be taking a closer look at some of the gameplay scenes and try to piece together a clearer picture of what Quantum Break will be like. Of course with an article like this, there’s always one question that needs answering first...What do we know of the game so far? We know it’s an action-adventure title developed exclusively for the XBOX One. The plot revolves around a failed time travel experiment taking place at Riverport University, which results in time breaking apart. In the game there are two main playable characters, Beth Wilder and Jack Joyce, who acquire special abilities to control time. However a third playable character (Paul Serene) becomes available, during the title’s “junction moments”. These junction moments creates a unique story for the player and bridge between the game and the television series. Both the game and live action episodes will ship as one complete pack. Now let’s start with the trailer! Riverport University. With pigeons! Look at that pigeon...so graceful. The first piece of new gameplay footage is revealed at 0:07 as Jack is jumping to a metal construction a few metres away. In the background, between the slabs of broken concrete, we see a shimmer of water (especially as the angle changes) hinting that Jack may be starting to cross the infamous bridge section. The image where the ship crashes into the bridge is something that we’ve frequently seen in trailers. In previous interviews Sam has also described this moment as being one of the game’s most iconic and memorable scenes. The image of destruction is a recurring feature in what we’ve seen so far, but it’s not just for that “Hollywood effect” or for the sake of doing it. As we see time literally break down, the frozen explosions become a motif which complements the game’s themes. At the 0:20 mark, we see a reappearance of the gameplay footage revealed during the XBOX One US Launch Event. In this scene, several large fragments of an abandoned vehicle are thrown towards the protagonist who, in the final moment, slows down time. This is presumably set after he discovers about Paul and Monarch, and (judging from the “lift bridge ahead” sign) just moments after the ship crashes. In the video, Sam talks about the protagonists possessing a series of time powers. While these haven’t really been touched on in detail yet, it’s possible that Jack isn’t slowing down or freezing time as the car shoots towards him from the carnage, but instead is beginning to reverse the scene. The next section replays some of the footage shown in the announcement video during the Microsoft Conference. Presuming that Jack does have the power to rewind time, the ship collision could potentially follow on just mere seconds after him slowing down time on the car. This would make sense as at 1:33, as the cars seem to shift back to their original position. If we think back to the trailer we saw during E3 with Sofia, time is only temporarily frozen. And while Beth could predict when it would resume (“sixty seconds, Jack”) they weren’t in complete control over the length. At present, the scale to which they can use their powers is unknown; whether it is isolated to a small event or if it’s worldwide. Jack had 60 seconds to save Sofia from the explosion, but what if the time distortion only affected that one room? Judging from the E3 trailer, the suspension didn’t look stable as various objects twitched between frames of time. If Jack does use his time powers to reverse or slow down time on the ship, would the time before resuming be shorter, as it is affecting a greater area? Also in relation to the office scene, as Jack walks through the debris, he passes an interesting-shaped object which resembles some sort of mask or helmet. It’s probably nothing, but it reminds me of Loki’s helmet. Remedy likes to incorporate little references in their games from television shows and books which inspire them, and anyone that follows Mikki on Twitter knows he’s a fan of the Marvel comics. Check out the right hand side. From 1:15, this is where things get interesting as we’re given a teaser into the game’s combat system and cover mechanics. We see Jack manoeuvre around cargo at night, the city’s skyline in the distance. While it’s difficult to judge the location from the few seconds of footage it looks to be a storage area possibly under the bridge the ship crashes into, or a harbour. (It also looks like we get a different view of the area at 1:38.) At this point Beth is nowhere to be seen either on a separate mission of her own (like Mona Sax in Max Payne 2) or just out of view. Alan Wake fans might also recognise the two glowing items near to Jack’s position. Due to the distance it’s hard to see exactly what the objects are, whether they are weapons, documents, collectibles or (more likely) ammo. The scene from another angle. 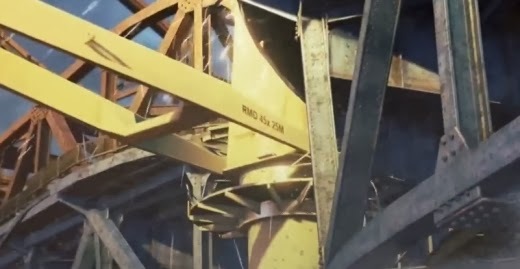 The following segment of gameplay footage returns to the ship crashing into the bridge, with a different angle which shows off some interesting looking markings on the side: “RMD 45x35”. RMD is frequently used over on the forums and on Twitter to indicate that the person is a developer at Remedy. Additionally the developer’s logo can also be seen on a number of car badges throughout the trailer. At 1:37, we see some more of the game’s combat mechanics as Jack is shooting at a series of soldiers (presumably workers at Monarch) in a seemingly empty street with the top of the lift bridge in the distance. Given the location of the confrontation, Monarch seems to be aware of the time anomaly which causes the crash. While details about the company haven’t been revealed yet, it’s possible that they could be researching and predicting when these events occur. Close up shots of the event show the bridge empty, with abandoned vehicles stretched over the road. I wanted to bring up something which really interested me at the 1:54 mark. Jack is standing in what looks like a construction site, staring at a circular hole in the wall. Around the space is the indication that a clock used to be present; there’s either engraved glass or a metal frame with roman numerals. If we look back to the original announcement trailer, there’s a moment when a group of people are gathered around a burning wreck, studying the carnage; beside the fire is a broken clock very much like the missing one. Of course that’s not to say that it’s the same clock or the same location; referring back to the game’s motifs, it would make sense for the title to include various images of broken clock faces. Throughout the trailer there are several scenes in which Jack walks across what looks like a construction site. Three different sections seem to fit together; the first being the stealth portion of the video and where we see Jack slow down time to avoid enemy bullets. The second is when Jack is walking through the boarded up corridor at 1:51. Finally, the third is with the broken clock. Judging from the changing skyline, the similar surroundings as well as the need for stealth, there’s possibly something significant about the area and the clock tower. Perhaps something that Paul didn’t want him to find? While we’ve mainly been looking at the gameplay in this article, there are a few new pieces of information announced in Sam’s commentary. One of the things that interested me the most was the “time anomalies”. I’m looking forward to learning more about these! We don’t know yet if they’re spontaneous occurrences or if the purpose of Monarch is to encourage these rips in time to happen to shape how they want the world to be. We certainly get the impression that whatever these things are, they’re dangerous and act as a catalyst for what Sam described as “the end of time.” We also learn that both Jack and Beth are present at the time of the experiment, so both protagonists have special abilities. Sam also stated that the player would need to master all powers to defeat the antagonist. In the VGX interview which followed, Ozz said that they are hoping to talk more about the time powers shortly! If you have any comments, ideas or interesting things you’ve noticed about the trailer I would love to read them! You can write your message in the comment box below. People on background while Sam talked kept skipping and changing during the video.